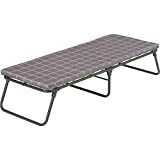 I have been a camping enthusiast for many years, in fact, since I could keep both ends off the ground, and over that time, I have seen some of the so-called best camping cots come and go. I must admit that I too have lost a few when they gave up on me, you know, me and my wife when we decided that two on the cot rated for one person would be better than one. Two can create warmth you know … but over time too, I have bought a cot or two that were keepers. Therefore, I believe I am something of an authority to write on camping cots. Currently, my cousin is using the Coleman ComfortSmart Camping Cot and I must admit that it lives up to its name. This one has kept me so comfortable many a night such that he has slept through the night. One night, he could not even hear as a naughty opossum went through his bag stealing stuff. Among all its features, the tough canvas is what I fell in love with. So far, it has held my cousin’s 180 lbs (~82 kg) every night of camping without causing so much as a squeak. In addition, this camping cot comes with its padded mattress, and it incorporates a new spring coil system that gives it a wonderful bed-feel. This camping cot comes with a limited one-year warranty. This means that if it develops a problem with one year of its purchase due to manufacturing defects, it will be replaced without any cost to you. If you are looking to buy a camping cot that will serve you well both at home and when you are out camping, the Coleman ComfortSmart will meet your needs perfectly. However, if you are heavier than 275 pounds (~124 kg) and taller than 5 feet 7 inches (~170 cm), you had better look for another one.